TEAM LAKE POINTE are a group of adults and teens who have decided to lay it all down and push beyond what may seem possible. The Spartan Sprint is a great introduction to the world of SPARTAN. At about 4 miles in length and numerous obstacles, this is not your average 5K. But as a TEAM, we will start and end TOGETHER, sharing the burdens and trudging thru the trenches - TOGETHER! Our TEAM will SUCCEED and we will indeed KNOW AT THE FINISH LINE! The ONLY requirement is the WILL to give it your ALL. Team Lake Pointe is OPEN TO EVERYONE! To JOIN TEAM LAKE POINTE, Register for the Spartan Sprint and select TEAM REGISTRATION-RACE WITH FRIENDS. Select ANY START TIME. (Actual Team start time will be assigned at a later date.) Search for: TEAM LAKE POINTE GRANBURY. Use LAKEPOINTE in the coupon code at checkout. SPARTAN will donate 15% back to Lake Pointe! you do not have to join our team to support lake pointe! register for ANY spartan race, spectator pass or kids race anywhere in the USA and enter LAKEPOINTE in the coupon code at checkout. 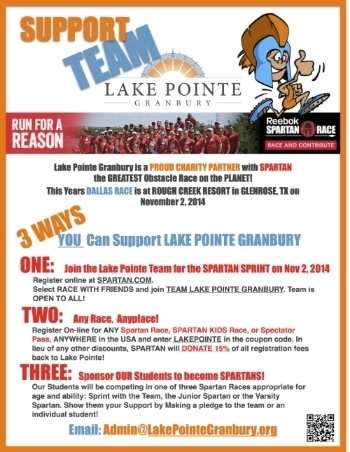 SPARTAN will donate 15% back to Lake Pointe!